It has often been the case with saintly and great personages in history, that their entrance into this world is preceded by unusual and extraordinary manifestations. Such was the case with the birth of Our Lord, of whom (the Gospels state) not only Angels, but also celestial bodies heralded His arrival into the world of men. Similarly with Saint Dominic, we are told by some of the earliest accounts of his life that his birth was presaged by curious dreams. Blessed Jane — writes Hubert of the Romans in his life of Saint Dominic — while heavy with the infant saint, had a dream in which she thought that she bore in her womb a dog, which, upon having come forth from her with a burning torch in its mouth, set the world ablaze with fire. Later generations of Dominicans would see in the dream a pun on the saint’s name. 8 Blessed Jordan of Saxony, in his Libellus tells us of another dream, one dreamt by the saint’s godmother: While he was at the baptismal font, as the saving waters of regeneration were being poured on him, a radiant light appeared on the child’s forehead. So brilliant was this light that it made the world resplendent. Dominic lived with his parents in their fortress home until he reached the age of reason — seven — at which age he was old enough to be educated. It was decided by his father, Don Felix, that he should be sent away to be with his uncle, the parish priest of Gumiel d’Izan, who would instruct him in the basic arts of grammar, Latin, and music. Saint Dominic learned how to read from his uncle, who, following the custom of the day, made him memorize the Psalms, and read and write in Latin as well as Spanish. He became familiar with the hymns and canticles of the Divine Liturgy, and in due time was received into the minor order of Lector, making him thus eligible to participate more intimately in the public worship of the Church. It was worship in common and the sacred chants of the Church that first fed his young mind, and laid in him a lasting love for the sacred ceremonies of the Church. When Dominic had reached the age of fourteen, he left the care of his uncle and went to the School of Palencia, which soon after (in 1208) became the first Spanish University as well as the first Royal University foundation in the whole of Europe. At Palencia he undertook the necessary studies that would prepare him for the grave responsibility of the priesthood. While at Palencia, he continued the ascetic practices he had become accustomed to during his many years with his uncle. He almost never ate meat with any of his meals, and habitually slept on the floor. He led a simple and pious existence while at Palencia, giving away, on many occasions, his meals to the hungry and poor. He fasted for days on end, and permitted himself no comforts or extravagances, the one exception being books, which he would purchase and annotate. (At that time, books were very expensive items.) These annotated volumes made for unique manuals of theology, which proved indispensable to his studies. Dominic developed a reputation among his classmates for sanctity; it was not long before his fame was noticed by Martin de Bazan, bishop of Osma. After becoming more familiar with the clerical student, the old bishop created him a canon of his Cathedral, with full rights to the income attached to the office, a practice not unknown at the time, but quite impressive, nevertheless. In 1195, at the age of 24, the young Canon from Calaruega was ordained to the Priesthood. He left Palencia behind him and returned to Osma to take up the obligations of his office. The chapter of canons at Osma had recently been reformed by the bishop and had, in light of these reforms, developed a reputation for holiness. Historians note that Martin of Bazan adopted the rule of Saint Augustine for his canons and won enthusiastic approval from Pope Innocent III for the statutes he drew up. 12 Under the approved Statutes, the canons were to be organized around the person of the bishop, who functioned as their supreme legislator. The canons, in their turn, carried out the ceremonial duties of the cathedral liturgy, and undertook the spiritual care of parish churches in the neighborhood of the cathedral, and in the small country churches scattered throughout the diocese. At Osma, Saint Dominic lived a hidden life. He seldom ever ventured outside the cloister, enveloping himself in the twin veils of prayer and study. He matured in his practice of the interior life, slowly permitting himself to be transformed into what Saint Catherine, his spiritual daughter, would call “another Himself” — that is, another Christ. This magnificent transformation was the seed of much the spiritual fruit born of his many labors in the years to follow. He daily learned to submit his will to that of God, setting the household of his heart in order, and gaining all the necessary virtues that would make him eligible to rule over the souls of other men. In the year 1205, Dominic (now sub-prior of the canons of Osma) and Don Diego, his bishop, were sent by King Alfonso IX of Castile on a diplomatic mission to the Lord of the Marches. Their goal was to finalize a marriage treaty between the young prince of Castile and the daughter of the said Lord of the Marches. To this day, scholars debate the actual location of these “marches.” Tradition has identified them with Denmark, but some reputable historians have proposed other places, such as the marches in the south of France, or even Italy. Though of great curiosity to historians specializing in the subject, this question is of little if any real importance. The true significance of the mission is the occasion which it furnished Don Diego and his young sub-prior to travel through the district of Toulouse, in the south of France, and see first hand the devastation wrought upon the flock of Christ at the hand of Albigensian heretics. Albigensianism, or Catharism, as the heresy is also known, is a type of Manichaeanism, which made its way to the West from the near Orient (Persia, Asia Minor, and Syria), via the returning Crusaders. In southern France, it spread among the women of the nobility, who remained the most committed segment of the population to embrace the heresy. The Albigensian women indoctrinated their children in the ways of Catharism, and won from their male relations protection from the authority of the Church, if not a total embrace by their men folk of the erroneous teachings. The movement established itself principally in the city of Albi in Lanquedoc (the southern French kingdom). It is from this city that the heresy derives its name. Albigensianism is essentially a Manichaean dualist system in which two principles of creation exist — two “gods.” The first of these is responsible for the material order, and considered evil. The second of these principles (or gods) is the one responsible for the spiritual order. He, of course, is good. On their first evening of the journey, the small band of Royal emissaries stopped at an inn is southern France to rest for the night. The owner of the inn was a heretic, who engaged the bishop and young sub-prior in a discussion. Up to this point, neither the bishop, nor Saint Dominic had any idea of the nature of this heresy, or the mental hold that it had on its adherents. The three argued late into the evening. The bishop, becoming sleepy, retired, leaving the young Dominic to carry on alone. After the royal embassy had resumed its course, word reached it that the young princess, the daughter of the Lord of the Marches, had died. Don Diego disbanded the embassy and took the opportunity to make an ad limina visit to Rome, to the court of the great reformer pope, Innocent III. He took with him Saint Dominic and a number of other clerics that had come with him on the embassy. The bishop had for a long time desired to travel to the far-off country of the wild Tartars and convert them to the Christian faith. He determined that he would ask the pope’s permission to be relieved of his obligations in Osma, and sent there as a missionary. When the bishop and his clerical band finally arrived at Rome, he reported to the pope the sad state of the Church in Lanquedoc. He then put in his request to retire his see and be sent north as a missionary. The pope refused his request, reminding him of the great work that still needed to be done in Spain. It was already Lent of 1206 when the small group of Spaniards, on their return trip to Osma, stopped at the famed monastery of Citeaux. There, Don Diego was so overcome with admiration for the monks and their way of life, that he asked to be invested in the holy habit of Saint Bernard. The request for investiture was not an odd one. It was not unusual for dignitaries, such as bishops, to be invested symbolically in the habit of a particular monastery, and thus show their attachment to and support of the given monastic community. On Easter of that same year, Don Diego received the holy habit from the Abbot of Citeaux in a solemn ceremony. With this, he also received permission to take back to Osma a few of the monks, to establish a new foundation in Spain, directly under the jurisdiction of the Abbot of Citeaux. Before crossing into Spain, the bishop and his entourage stopped at the monastery of Montpellier. Here, they met Peter of Castelnau and Maitre Raoul, papal legates especially appointed to deal with the Albigensian heretics of southern France. The legates had been laboring among the heretics for over a year and had no results to show for their efforts. Frustrated and disappointed, they asked the bishop, since he had only recently returned from Rome, for some advice. The bishop responded that their difficulty lay in the pomp with which they traveled the roads to preach the gospel. The reason for the pomp was to communicate an impression on the hearers of their message that they came with the full authority of the Roman Church. It was a symbolic gesture that backfired on the legates: Not only were the heretics not impressed with their importance, but they held them in contempt. It was obvious to Don Diego and Dominic that it was hardly conciliatory to men who believed all material things to be evil, to see the representatives of papal orthodoxy exhibit precisely the type of material splendor they held in the highest contempt. Albigensianism, explained the bishop, could only be extinguished with fasting and prayer, and an asceticism that might perhaps seem also exaggerated. The servants of the Gospel must find their models not in the earthly courts of kings, but in the disciples sent out by the Lord to preach barefooted, without staff or scrip; after all, in their day those first preachers of the truth filled the earth with the light of Christ’s Gospel. Dominic, though he may not have known it at the time, discovered in the old bishop’s decision to remain in southern France the idea for his future order. At Servian, in 1206, Saint Dominic, Don Diego, and the legates made their first joint effort at debating the Albigensian heretics. They had challenged two of the leading Perfects of the area, Theirry and Baldwin. When they arrived in the city on foot, their conspicuous poverty at once caught the attention of the populace. The dispute lasted eight days. In the end, the audience of mostly heretics was so impressed with the new Catholic initiative that, though neither of the two parties had been declared victor, they escorted Brother Dominic and his companions to the next center of Albigensianism. Dominic traveled from one town to the next, winning debates and impressing his audience by the degree of austerity with which he lived his life. On one of these occasions, the judges, not being able to agree on who was the winner of the debate, decided to submit Brother Dominic’s libellus to an ordeal by fire. (Such ordeals were a customary way of arriving at a conclusive decision in those days.) The saint’s libellus, his theological manual, was thrown into a fire three times, and each time the book was returned from the flames unharmed. On the evening of July 22, 1206, the feast of Saint Mary Magdalen, Saint Dominic sat reading outside the north gate of the city of Fanjeaux. He lifted his mind and heart to the Mother of God and asked her for a sign to indicate to him what exactly he should do, and where exactly to place the center of his apostolic work. As he looked down into the valley of Lauragnais, a flaming ball opened the sky and descended, hovering for a while, and finally came down over the little abandoned church of Prouille. Not willing to believe the vision at first, Saint Dominic, once again asked the Blessed Virgin for a sign and again the same ball of fire appeared, hovering over the little church. The miracle occurred a third time, after which he finally accepted the sign as authentic, and not the product of his imagination. This miraculous vision, known as the Signadou — the sign of God — was the catalyst for the foundation of the Order of Preachers. Saint Dominic reported his vision to Don Diego, who realized at once what the Blessed Virgin wanted them to do. Saint Dominic had in the course of his public disputation converted a number of women to the Catholic faith. The saint collected nine of these women and placed them in the Church of the Prouille. This was the first foundation of the Order of Preachers, better known as the Dominicans. The community of Prouille was founded for three reasons. The first of these was to function as an information center. Though the nuns could not come out of the enclosure, others could and did come to visit them. Saint Dominic was very aware of the great role that women played in the spread of the heresy, so he was intent on fighting the devil with the devil’s own method. Secondly, it was to function as an educational center for children. Again, the heretics, who for so long mimicked the Church to gain an advantage over her, were now being mimicked by their greatest adversary. 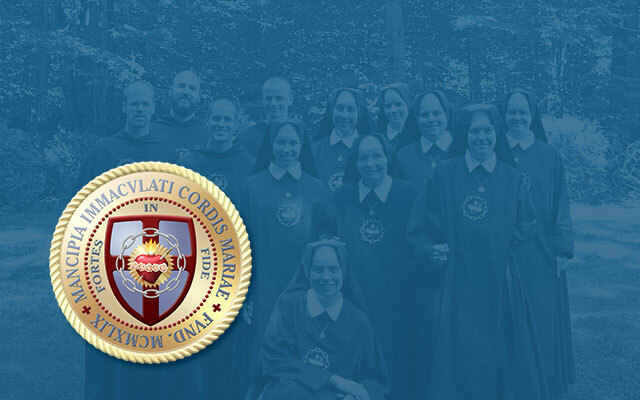 Finally, Prouille was a refuge for those women, who, having returned to the practice of the true faith, needed to escape the hostile environment of their former heretical surroundings. Many years later, in 1218, after having observed the success of efforts at Prouille, Pope Honorious III asked Saint Dominic to reform the practice of religion among the nuns of Rome. But this will be discussed in the appropriate place. Two events are paramount in the foundation of the Order of Preachers by Saint Dominic. The first of these is the withdrawal of Don Diego of Osma from the mission. Don Diego returned to his diocese in the summer of 1207. Initially, the holy bishop had intended to return to the south of France, but God called him to Himself, and Saint Dominic was left to fight against the Albigensians without the support of his spiritual father. The second event was the war that broke out after the January 14, 1208, murder of Peter Castlenau. 21 Saint Dominic then worked closely with the crusade against the Albigensians, a crusade organized by Simon de Montfort in retaliation for the murder of the Cistercian inquisitor. But after the failure of the crusade to end heresy in the region of Lanquedoc, the saint concentrated all his efforts on the better organization of the preaching mission. The small band of preachers that had been for so long loosely organized around the authority of the papal legates, and the personal charisma of Saint Dominic and Don Diego, were finally organized in a more permanent manner by bishop Foulques of Toulouse. In July of 1215, he extended episcopal authority to the band of preachers. But the spirit of God illuminated the imagination of Saint Dominic to conceive of his work as a gift to the whole Church. While the bishop of Toulouse could only think of the preaching band as a diocesan organization, Dominic was already beginning to make other plans. The pope did not approve the new order. The council had forbidden any new orders from being established, and Innocent stood by the decision of the council. However, he ordered Saint Dominic to return to his small band of preachers (at this point in its history, the order had six members) and have them select from among the already existing rules, the one under which they would be willing to live. On his return to Toulouse, Saint Dominic discovered that his band of six had grown to sixteen. These sixteen brother-preachers met in August of 1216 at Prouille. After asking the Holy Spirit for His assistance, they decided under which approved rule they would live: They chose the rule of Saint Augustine. On August 15, 1217, the saint gathered his band of sixteen members at Toulouse, at the church of Saint Roman, which had been given to the Preaching Friars by the bishop of that city. He ordered his disciples to renew their vows and dispersed them throughout France, Spain, and Italy. With this dispersal, the order experienced a dramatic growth. By 1220, the year before the death of Saint Dominic, convents of friars existed in every European nation, and the order itself numbered hundreds of friars and nuns. Saint Dominic, who had dispersed his brothers when they were only sixteen members, himself traveled once more to Rome. It was this stay in the Eternal City during which Pope Honorious III asked the saint to reform the nuns of Rome. His effort in this regard was the foundation of the monastery of nuns at Santa Maria in Torre , in Trastevere. This community, located next to the church of Saint Cecilia, still exists today. It has been, throughout its existence, a model of religious life in the city of Rome. At the same time he reformed the nuns, he also established houses of Preachers. In May of 1221, he left Rome for Bologna, where he held the third general chapter of the Order. The Order had been established and had grown to six provinces, and the Albigensian heresy had been eradicated through the preaching of the brethren. In June of 1221, Saint Dominic became ill. He had been on a trip to Venice, but returned to Bologna. He never recovered from his illness. 1 Breviary of the Order of Preachers (Dominican Breviary), Part Two, Browne and Nolan Limited, Dublin 1967, First vespers of the feast of Saint Dominic. St. Dominic is interred in Bologna. 2 Vicaire, O.P., Marie-Humbert, Saint Dominic and His Times, McGraw-Hill Book Company, New York 1964, p.7. 3 Beatified by Pope Leo XII. Her feast day is celebrated on August 7. 4 The word “canon” will appear in this article in this sense. The primary meaning is that of a priest or any cleric who belongs to the “chapter” (or staff) of a cathedral church. The term “canon regular,” which denotes certain male religious, is related. As used among the secular clergy, “canon” eventually came to be an honorary title, much like “monsignor.” In this last meaning, it is unused in the United States, but still common elsewhere. 5 Marines, Mames, Mannes, Manes, and Mamertus are all various spellings of this Blessed’s name. 6 Beatified by Pope Gregory XVI. His feast is celebrated on July 30. 7 Jarrett, O.P., Bede, Life of St. Dominic (1170-1221), Dominicana Publications, Wahington, D.C., p.17. 9 Dominican Breviary, Matins, second nocturn, IV lesson, Feast of Saint Dominic. 10 Vicaire, op. cit., p.28. The reference was to vellum, the sheep’s skin, upon which books were written at that time. 11 Dominican Breviary, Matins, second nocturn, V lesson, Feast of Saint Dominic. 12 Jarrett, op. cit., p.21. 13 Dominican Breviary, Matins, second nocturn, VI lesson, Feast of Saint Dominic. 14 Laux, John, Church History, Tan Book and Publishers, Rockford, 1989, p. 350. 16 Jarrett, op. cit., p.30. 17 Vicaire, op. cit. p.52. 19 Dominican Breviary, Matins, First nocturn, III Lesson, feast of Saint Dominic. 20 Ibid, third nocturn, VII Lesson, Feast of Saint Dominic. 21 Dominican Breviary, Matins, First nocturn, III Lesson, feast of Saint Dominic. 22 Jarrett, op. cit., p.143. 23 Dominican Breviary, Lauds, little chapter, Feast of Saint Dominic.